New Winter 2018: Freedom isn't free, as General George Washington first said, and those who sacrifice to protect our freedom should be recognized. 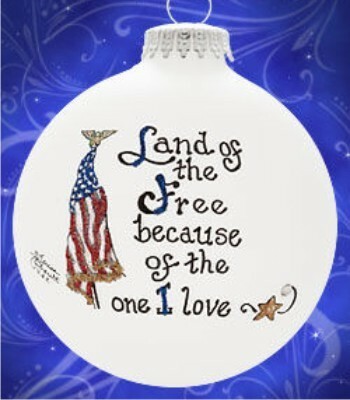 The land of free home of brave personalized Christmas ornament is just one way to show your love and appreciation for the service of a family member or close friend. This military ornament personalized by the artist in the attractive details is accented with glitter to draw to it the attention it deserves in any holiday display. Show your pride, appreciation and admiration for someone on active duty, retired or in the Reserves or National Guard with the American flag military ornament personalized for lasting significance.